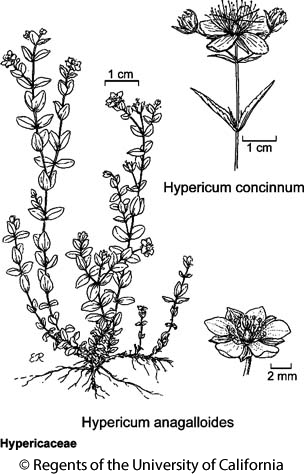 Habit: Annual or perennial herb 3--30 cm, from matted stolons. Stem: prostrate to decumbent, slender; lower nodes rooting. Leaf: below inflorescence 4--15 mm, elliptic to +- round, gland-dots clear to green, base +- clasping; above lowest flower branch abruptly reduced, linear. Inflorescence: flower branches near stem tips; flowers 1--15 (many) per stem. Flower: sepals 2--4 mm, unequal, lanceolate to ovate, obtuse or acute; petals 2--4 mm, +- = sepals, gold to salmon; stamens generally 15--25; styles 1--1.5 mm. Fruit: +- 3 mm, spheric to oblong. Seed: < 1 mm, yellow-brown. Ecology: Meadows, marshes, seeps, springs, streambanks, lake margins; Elevation: < 3220 m. Bioregional Distribution: NW, CaR, SN (exc Teh), ne ScV, e SnJV, CCo, SnFrB, SnGb, SnBr, PR, MP; Distribution Outside California: to British Columbia, Montana, Arizona, Baja California. Flowering Time: May--Sep Note: Large, low elevation plants approach Hypericum mutilum. Citation for this treatment: Robert E. Preston & Jennifer Talbot 2012, Hypericum anagalloides, in Jepson Flora Project (eds.) Jepson eFlora, http://ucjeps.berkeley.edu/eflora/eflora_display.php?tid=28732, accessed on April 20, 2019. NW, CaR, SN (exc Teh), ne ScV, e SnJV, CCo, SnFrB, SnGb, SnBr, PR, MP; Markers link to CCH specimen records. Yellow markers indicate records that may provide evidence for eFlora range revision or may have georeferencing or identification issues. Purple markers indicate specimens collected from a garden, greenhouse, or other non-wild location.